Isobar Brazil’s Tech Girls ‘Dumb Inventions’ campaign – a collection of posters that promoted the Tech Girls documentary series about women’s potential to combat misogyny in the fields of science, games and technology for Samsung Brazil – won Bronze in the Print & Publishing category at Cannes Lions last week. In Brazil, Samsung was perceived as a tech-only brand, and they needed to reconnect with consumers through a people-first narrative. The Tech Girls work addressed gender inequality as a vehicle for Samsung’s new global brand positioning, “Do What You Can’t”, reinforcing Samsung’s commitment to society and to generating co-prosperity. To promote the Tech Girls docuseries, Isobar Brazil raised the issue of gender differences through a collection of campaign posters showing real life approved patents for bad inventions by men, in comparison to great ideas and inventions by women whose patent applications were denied. 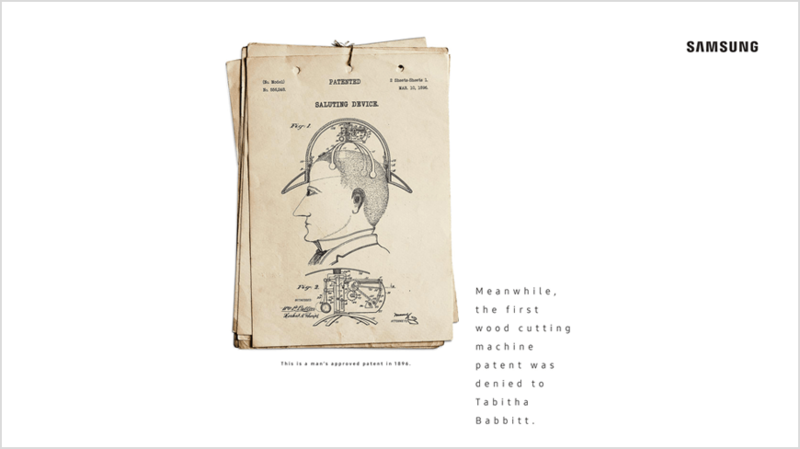 The ‘Dumb Inventions’ campaign posters highlighted the valuable innovations that were denied as a result of the gender of their inventor, with examples including the first computer algorithm by Ava Lovelace, the first wood cutting machine by Tabitha Babbitt and the first washing machine by Ellen Eglin. At this year’s Cannes Lions Festival, Isobar also won the Grand Prix in Digital Craft for ‘Aeronaut’, an immersive VR experience for William Patrick Corgan.